A common complaint that people make when training their dogs using food rewards is, “my dog won’t do anything that I ask him to unless I have food in my hand.” Well, first you have to ask yourself if you’ve trained your dog to follow a command while you are showing him a piece of food while you’re asking him to do something. 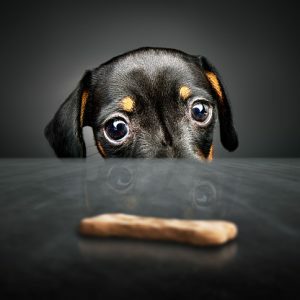 If you have that food right in front of the dog’s face, your dog will see that food as being part of the entire cue for doing that particular behavior. That’s why he isn’t following your request when you omit that cue. I’m going to give you a random reinforcement schedule below to help get you started. You can then develop your own random schedules as your dog gets further along with other types of rewards. These subsequent RR Schedules should use less and less food treats and more of other types of rewards. Make a list of all the things your dog loves and use them in your reward schedules. Here is your sample of a Random Reinforcement Schedule. The numbers listed are those times that a dog does a behavior in which he is rewarded with food. All other times are rewarded with alternatives. 1, 3, 6, 8, 9, 10, 13, 15, 18, 21, 22, 23, 26. Ages 3 weeks to 12-14 weeks are THE most critical developmental stages of life for puppies – This is the SOCIALIZATION PERIOD. Dogs MUST BE EXPOSED to other dogs from ages 4 to 6 weeks. Dogs MUST BE EXPOSED to people from ages 6 to 12 weeks. Experts used to think we had until the dog was 16 weeks to socialize him to people, but they’ve discovered this to be inaccurate. If we fail to sufficiently socialize our puppies at this age to all sorts of dogs and all sorts of people, we will wind up having a dog that is always scared of other dogs and people. Now you can see why it’s so important for breeders to do what they’re supposed to do during these critical ages. I’ve gone into homes to train puppies where they didn’t get the puppy from the breeder until he was 12 weeks old. This happens a lot with the toy dogs. But if the breeder didn’t expose the dog to enough people, guess what happens? The dog becomes shy and fearful, which can lead to aggressive behavior. 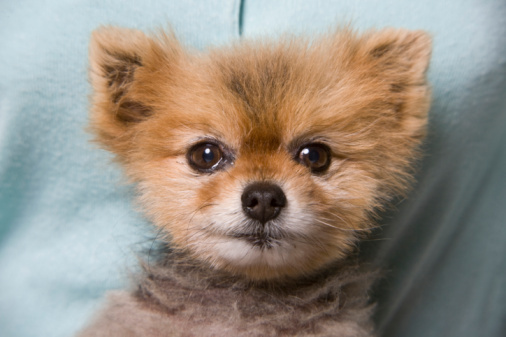 Irresponsible breeders set the dogs up to fail if they keep them too long and don’t socialize them. During the socialization period, puppies need to be exposed to all situations that it’s likely to encounter during its life. THIS is the time to take your puppies to puppy kindergarten classes. Don’t let your vet talk you out of going to classes at 9 weeks. Although there is SOME risk of health problems, the risk of your dog developing fear and defensive behaviors due to lack of socialization is much too risky. MORE DOGS DIE TODAY, NOT FROM DISEASE, BUT FROM BEHAVIORAL PROBLEMS DUE TO LACK OF SOCIALIZATION. If we miss the opportunities to socialize our puppies and to teach them certain things at this age, we can retard their development and ability to learn in the future. Much of the aggression we see in dogs is the result of insufficient socialization to other dogs and humans by the time the dog is 12 weeks old. Socializing your puppies doesn’t mean just casually introducing them to your family and friends. You need to get these dogs out and about and in as many public settings as you can. However, don’t do this all in one day, PLEASE. You should be introducing your new puppies to 5 new people every week, and then 5 more, and so on as he goes through the socialization period. Researchers, Drs. Scott and Fuller state that puppies should never be adopted before 6 weeks of age, and best not before 7 weeks. The puppies need to be interacting with their littermates prior to those weeks is very important in their development. At around 8 to 10 weeks, puppies go through a fear period where it’s very susceptible to physical and psychological trauma, and if something bad happens during that 2 week period, the effects could be permanent and irreversible. That’s why it’s best to get your puppy around the 8th or 9th week, so that YOU can control what’s going on in his life. Dog’s who experience abuse at this age, or if they have bad experiences with vets or other dogs, or ANYTHING that causes them emotional or physical harm, this poor dog will be traumatized for life by those scary events. 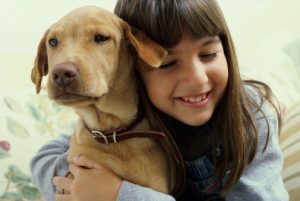 Maybe now you’ll realize that punishing your puppies for housetraining accidents when they’re going through this fear period can cause terrible problems with your relationship. If you scare him by punishing him now, he will never fully trust you. Textures, like pavement, rugs, cement, metal, sand, grass, gravel, vinyl flooring and dirt. If your 8 to 12 week old puppy is kept in his kennel most of the time, he’ll become fearful and hard to rehabilitate!! This would equate to the infant who is given little or no mental stimulation. They become mentally disabled for life. Now we come to the time that will try men’s souls – the canine period of adolescence – YIKES! This is when you want to go on a cruise around the world and not come home until your dog is at least 2 years old! When your puppy becomes 4-5 months old, you’ll notice that he becomes VERY independent. The puppy that wouldn’t leave your side now won’t come to you anytime you call him. When he was a bit younger, he was so easy to train, but from 4 to 10 months, he may become fearful and cautious even to people and novel things he was fine with before (this is the 2nd fear period that dogs go through). If you were training him early on, that will pay off now because he will trust you to guide and protect him through this. NEVER PUNISH YOUR DOG FOR BEING AFRAID OR YOU CAN TOTALLY RUIN THE DOG! Your dog is always looking to you for guidance and encouragement, especially if he’s fearful. If you scold him because he isn’t comfortable meeting Uncle Joe, you will only convince him that Uncle Joe is not a good thing! So…there you have it. If you can get through your puppies first 18 months you can get through ANYTHING. Now, if you’ve got kids that are growing up with your dog, and THEY’RE going through their adolescent periods, I don’t envy you one bit! Generally, I prefer using the basket style muzzle; it has wire openings that are large enough on the sides to feed the dog treats, and the dog still has the ability to pant and to drink water. 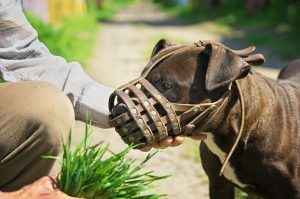 Sometimes these muzzles are available in Petsmart or other large retail pet supply stores; but, you can also get one directly online at: http://www.morrco.com/wirbasdogmuz.html Be sure you get the correct size for your dog. You’ll see a page that will help you decide which size is best. Dogs are happiest when they know there are rules and boundaries to live with. But… it’s imperative that we teach those rules to our dogs and not to take for granted that they already know them. 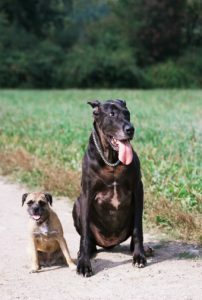 Dogs that lack confidence in their humans to implement rules and define boundaries can become extremely anxious and stressed. All sorts of problematic behaviors develop in our dogs when we spoil and coddle them, when they’re allowed up on furniture, such as beds and sofas without getting our permission first, and when we allow them to practice all sorts of inappropriate behaviors as puppies because we think they’ll just grow out of it. Remember that “practice makes perfect.” If dogs get to practice all the wrong things, serious behavior problems will be the end result. Show good leadership skills by NOT punishing your dog! Hollering and screaming at dogs, hitting and smacking them with newspapers and pointing fingers at them saying “BAD DOG!” will not teach them to behave appropriately. These tactics will only teach your dog that (1) you have poor leadership skills, (2) you can’t handle him, (3) you can’t make good decisions for her, and (4) you can’t be trusted. Implement the following program and your dog will become a well-mannered and polite companion pet. Do not give your dog attention when he/she demands it! Do not allow your dog to jump all over you or push his/her toys into your leg. Do not give your dog attention or affection when he jams his nose under your arm. Do not give your dog attention when he paws at you or he barks in your face or if he mouths you. If any of these behaviors are part of your dog’s daily routine, learn to remove yourself immediately by walking away from him/her every time he/she behaves in a pushy and demanding manner. 1. Sit & wait before getting all meals (avoid all free-style feeding). 2. Sit before getting any treat (never offer a treat just because your dog is cute and he’s breathing). 3. Sit before getting a new toy or chewie. 4. Sit to get the leash put on. 7. Sit before you initiate any games with him. 9. Sit & wait before getting out of the car (wait helps keep your dog from bolting out). 11. Sit before getting anything he wants or needs in his life. 12. Sit before being allowed to sit on the sofa (or bed)* You may want to think twice about giving this privilege in the first place! Remove this privilege if your dog is showing any aggressive behaviors. 13. Your new motto should be “SIT HAPPENS!” You will notice that your dog is a lot calmer after about a week of living with this structured and regimented routine. He will begin to offer sits on his own, which tells you he is actually asking you for permission!